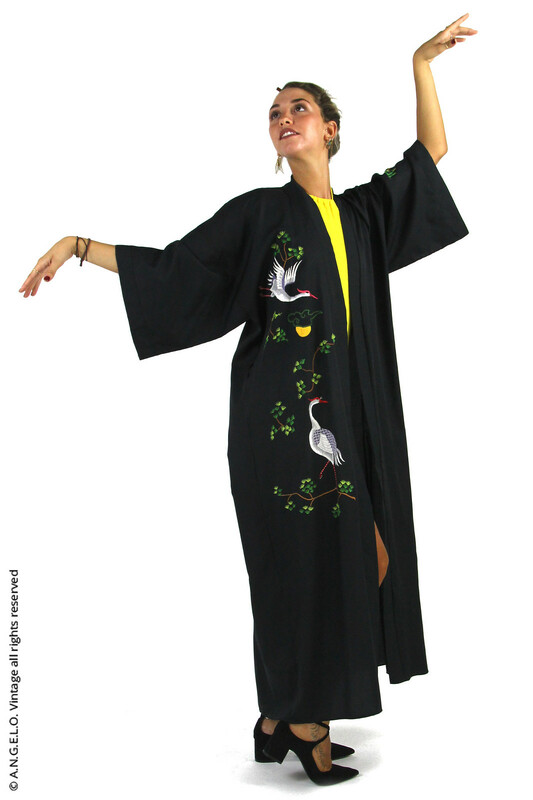 Asian Vintage Clothing: Kimonos - A.N.G.E.L.O. Kimonos (which literally means a “thing to wear” or better “dress”) is a traditional Japanese garment. With a T-shape and a neat and clean design, it reaches to the ankles and features long collar and sleeves. It is secured with a wide belt tied at the back called “obi”. The history of kimono is closely linked to the development of Japanese textiles and weaving techniques. In fact, its main distinctive feature is that it tends to highlight the material it is composed of – if Western clothing is designed to show off the body shape, kimonos are created from rectangular hand-cut pieces of silk fabric that are sewn together to hide the figure. Originally, kimonos change depending on occasions, age, gender and social class and significantly express the type of people who are wearing them. 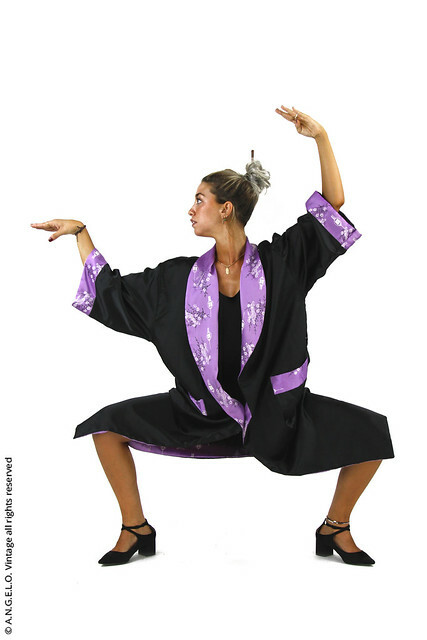 The level of formality of women's kimonos depends on their shape (mainly the length of the sleeves) and especially on design, fabric and colour. Men's kimonos, however, have generally the same shape and dull colours. Only during the Asuka period (550-700), Chinese embassies will introduce new fabric dyeing techniques that would spread the use of vivid colours. Traditional equals obsolete? Not at all. Still today, women, men and young adults all around Japan wear kimonos, particularly on special occasions. The Japanese wear kimono's modern versions – in less expensive and delicate fabrics like rayon, cotton, polyester or other synthetic fibers – and even traditional ones, maybe vintage and inherited by their grandparents, with contemporary clothes and accessories. Kimonos enchant even Western fashion with their legendary and magnetic allure. 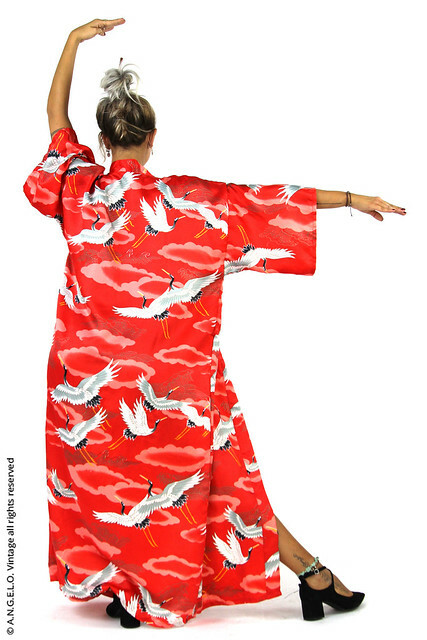 Women and men internationally wear kimonos as a whim: at home they wear it as a simple, elegant night robe, but they also throw it on to go out as a cover-up to bring the white t-shirt and blue jeans combo to the next level, or straight on the naked skin as a dress. We selected a range of kimonos – unique, exotic pieces – perfect for making any of your summer looks sophisticated. Discover it in our shop and in our online store.